On 21. and 22. 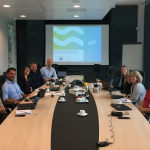 September 2017 there was a meeting at KWR in the Netherlands to discuss the application of the Decision Support System (DSS) tool on Ecosystem Services. It was attended by partners from KWR, Emscher Genossenschaft, CetAqua, NTUA, Sintef and representatives of every demonstration case. During the meeting it was decided to apply the tool to the various demonstration cases of Dessin at the LLobregat area in Spain, Athens in Greece, Westland in Holland, Hoffselva in Norway and the Emscher region in Germany. The tool will be used to evaluate the impact of the technical solutions in the demonstration cases on the ecosystem by the possible upscaling the pilot plants. Will it be worthwhile? Assess your ecosystem services to find out! 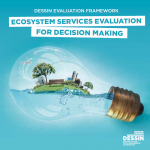 The free Ecosystem Services (ESS) evaluation software tool by DESSIN helps decision-makers to make the best choice by evaluating the effects that innovative solutions have on freshwater ecosystems and their services. The tool identifies and measures the ecosystem services that are provided to humans by nature. While this may sound simple, many different ecosystem services may be present at a particular location, and the tool helps to make sure that all of them are considered. It suggests indicators for measures of ESS provision and use, as well as economic valuation methods. 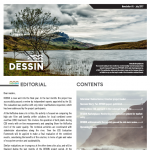 In the 5th issue of the DESSIN newsletter you can read about the latest news and achievements of the project. The publication includes a description of the technologies that are being tested in the Emscher demo site and an interview with Nadine Gerner, the Emscher project leader. In the DESSIN Marketplace section you will find explained the monitoring and evaluation system for market entry, developed by Adelphi. 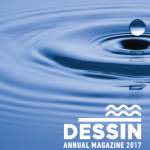 In the ESS Section there is a brief summary of an interesting article on the DESSIN Ecosystem Services Evaluation framework, applied to the case of the use of infiltration ponds for artificial aquifer recharge in the Llobregat (Barcelona) mature site. Last, but not least, the final DESSIN event, which will take place as a public workshop on November 28th in Brussels alongside with the WssTP Water Knowledge Europe brokerage event, is announced. Please take a look at our Call for Papers. On 28 November 2017 the final DESSIN event will take place in Brussels. The joint DESSIN and WssTP workshop will deal with Ecosystem Services (ESS), Nature-Based Solutions (NBS) and Hybrid Grey-Green Infrastructure (HGGI). Call for papers: We are inviting European and international projects that are at an advanced stage to present their key findings and success stories about implementation and benefits of ESS concepts, NBS or HGGI in the water sector. Projects should have a clearly applied focus, not on fundamental research but dealing with the actual (and successful) demonstration of solutions and benefits. 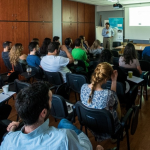 EYDAP and NTUA organized two informative DESSIN workshops, which were held on 23rd and 25th of May 2017 at the premises of EYDAP in Athens. Aim of the workshops was the demonstration of DESSIN results and Athens’ sewer mining pilot to specific groups of stakeholders. The first workshop was attended by graduate, post-graduate, PhD students and by post-doctorate researchers from the fields of water and environmental science. The second was mainly addressed to water utility managers, municipal authorities and academic experts. 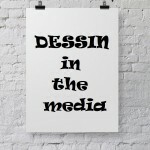 The next annual DESSIN magazine is now available for download. Focus of the issue mainly lies on a review of the last project years and an outlook of the upcoming and final project year. 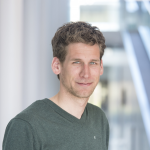 There also is an interview with DESSIN scientist Dr.Koen Zuurbier (KWR), who graduated at the TU Delft on findings from the Westland demo site. 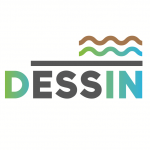 Furthermore, there is a piece about the DESSIN Ecosystem Services Evaluation Framework, a piece about the demo site in Westland and an article about the Green Business Award for DESSIN and EYDAP. Enjoy the read! A special issue on managed aquifer recharge (MAR) of MDPI Water has been released. It is aiming at hydrogeochemical and water quality management aspects, such as the benefits of self-purification during aquifer recharge and storage, including bank filtration, and problems due to undesired water-aquifer interactions and clogging of infiltration and injection systems. From both, the Barcelona and the Westland demosite, a paper was submitted and accepted for publication. At the Emscher site, two innovative technologies have been – or are still being – pilot-tested. Both have the aim to improve water quality in rivers and streams which will have positive effects on ecosystem service provision. This improvment is being achieved via a reduction of overflowing combined sewage water into streams during heavy rain events or – in case overflows occur – via a reduction of the particle load entering the streams. 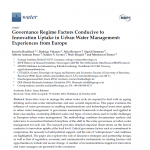 DESSIN scientists from the Ecologic Institute and Emschergenossenschaft in Germany, KWR Watercycle Research Institute in Holland, SINTEF in Norway, CETAQUA in Spain and DHI (Danish Hydraulic Institute) in Denmark have published an Open Access Paper about European experiences in Governance Regime Factors Conducive to Innovation Uptake in Urban Water Management.